pianomania: According to this photograph in The Straits Times, MAURIZIO POLLINI HAS DIED! According to this photograph in The Straits Times, MAURIZIO POLLINI HAS DIED! section two of The Straits Times. 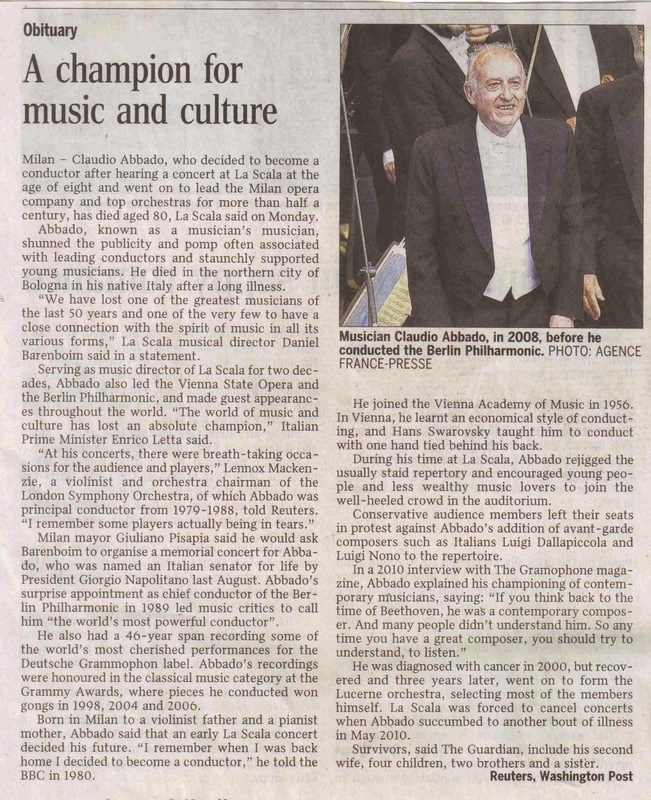 The classical music world has been mourning the passing of the great Italian conductor CLAUDIO ABBADO (1933-2014) who died in Milan after a long struggle against stomach cancer. Tributes are plenty in the news and mainstream media for one of classical music's patricians and most respected personalities. 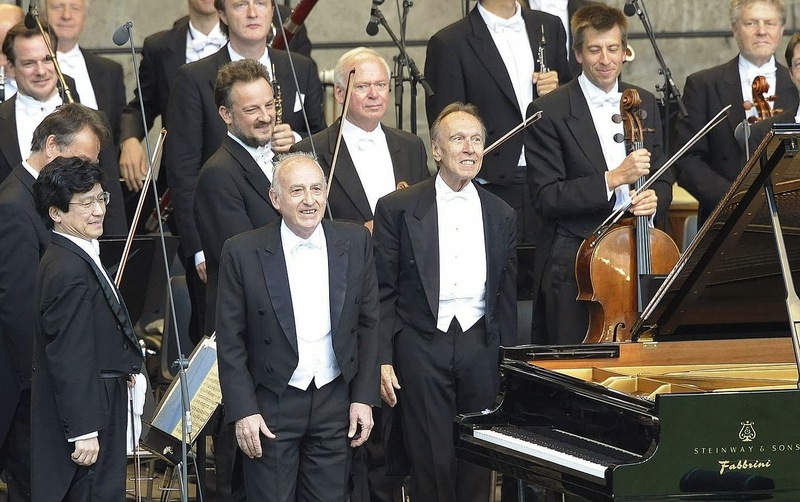 Somebody in the newsroom has however made a booboo by posting a photograph of great Italian pianist Maurizio Pollini instead! Death rumours of Pollini have come and gone, but this is beyond ridiculous! Here is the original photo of the two Italian maestri with the Berlin Philharmonic which was wrongly cropped. They got the wrong guy! This is what the article should have been! 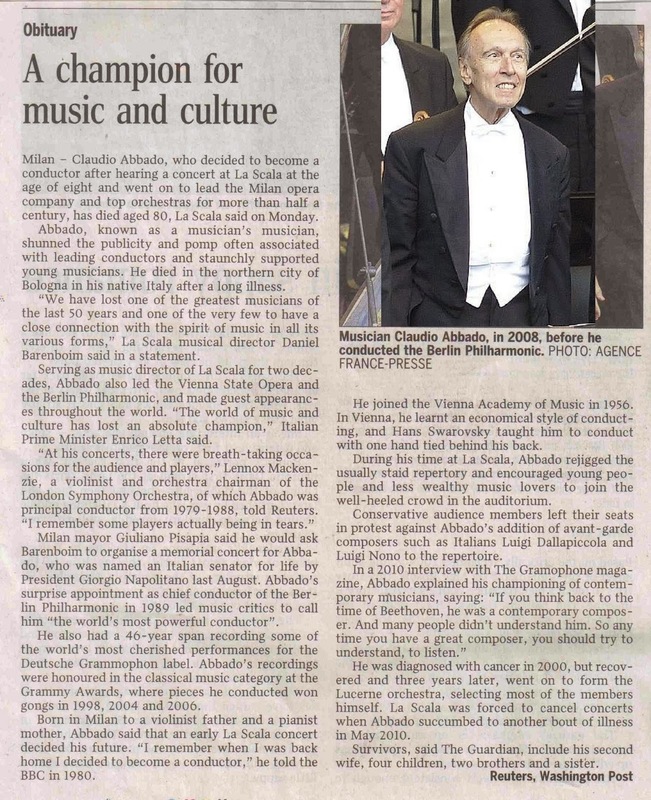 I have checked with an editor in The Straits Times, and it transpired that the news agency that sent them the article had sent them the wrong photograph (Pollini's instead of Abbado's). Later it issued a retraction for the photograph to be pulled, but I believe that might have been a little late for the printing presses. Hmmm... so it pays to be able to know your virtuosos. Ming Pao Daily of Hong Kong made the same mistake And i wrote this little research on the wrong photo.